An undated view of 25123 at Northwich depot. The eighteen year eleven month career of D5273/25123 was spent allocated to a variety of London Midland Region depots. Boiler room grilles sheeted over (March 1979). 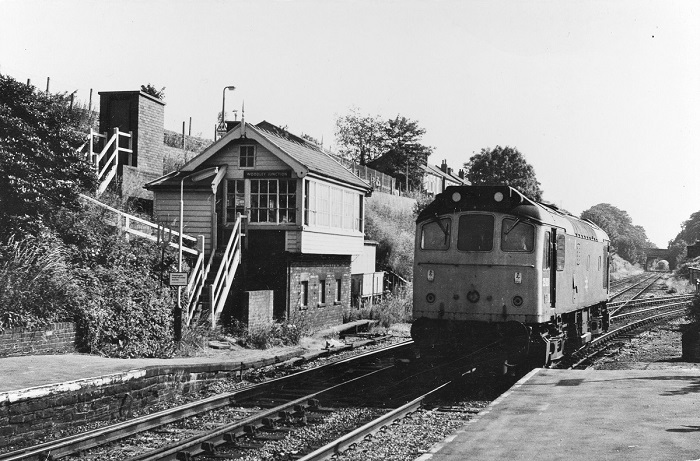 June 1964 to Wellingborough (15B). September 1965 to Leicester Division (D15). July 1967 to Warrington (8B). December 1967 to Longsight (9A). 25123 was the 177th Class 25 withdrawn, one of six retired during May 1983. 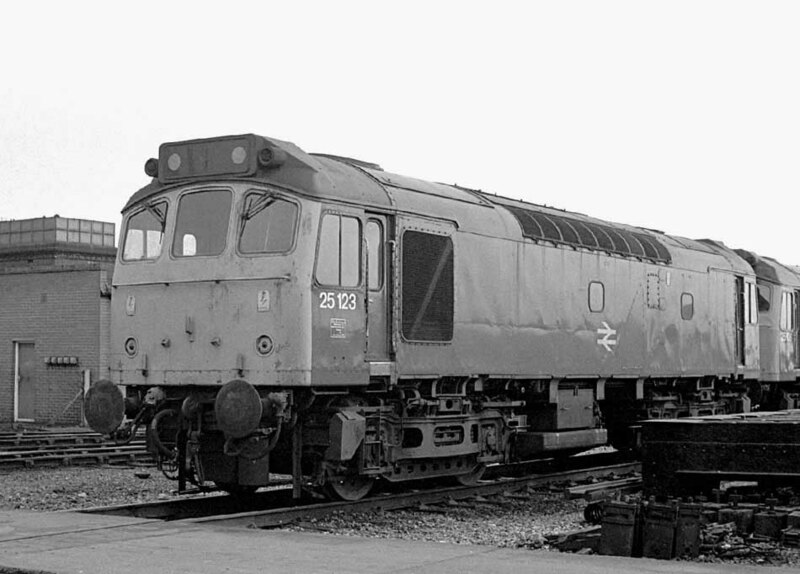 After withdrawal 25123 was stored at Bristol Bath Road until November 14th 1984 when it moved to Swindon Works. The Works closed prior to 25123 being broken up, it was moved to Cocklebury Yard on May 26th 1987, then to Oxford Hinksey Yard on June 2nd 1987, entering Vic Berry's yard on June 11th 1987 (see move details below). The locomotive was cut up by the middle of July 1987, although the cabs remained for a little longer. Noted Derby Works December 1976 - April 1977. Noted Derby Works February - March 1979 (General repair). An early working for D5273 occurred on July 18th 1967 handling the 09.00 Manchester Victoria - Glasgow Central to Preston with 7639. The recently arrived Crewe allocated Type 2’s began to replace steam in the Cheshire, Wirral Peninsula & North Wales regions. By August steam at Croes Newydd shed in the shape of 75060, 76037/39/40/88 were stored, likewise a similar situation at Shrewsbury shed. 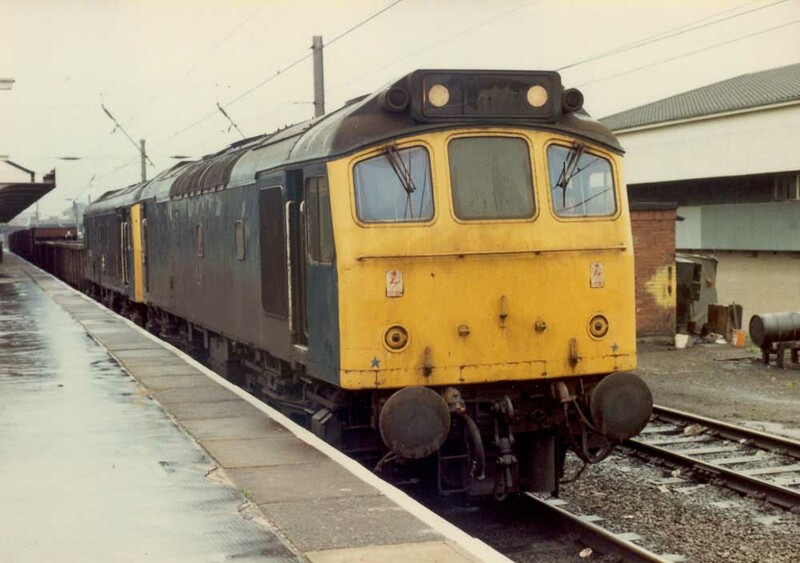 By August Crewe had gained the remaining Class 24’s from Ipswich (D5036 - 5049) and EE Type 4’s D200 - 209 from Stratford, both moves made possible by the greater availability of the Class 31’s and 47’s. These additional machines allowed training of the Springs Branch crews on EE Type 4’s and Sulzer 2’s. D5273 (8B) broke new ground in the first week of August working local diagrams in the St Helens area. On May 24th 25123 worked the roundtrip Nottingham - Llandudno Town whilst on August 9th the Walsall - Norwich (for Yarmouth) - Derby diagram was handled with 25212. August 21st 25123 returned to the Walsall - Norwich (for Yarmouth) - Derby diagram with 25107. The same pair worked a relief Derby - Skegness roundtrips on August 23rd & 26th. The 13.45 Crewe - Cardiff was worked by 25123 on October 3rd. 25123 was noted at Derby Works on November 23rd with minor collision damage, the buffers had been knocked off at the No.2 end (information from a close-up view of the No.2 cabfront). 25123 was borrowed by Laira on May 15th to work the 15.50 Paignton - Exeter St. Davids. Photograph collection of webmaster. 25123 at Woodley Junction on July 11th 1977. Shortly after midday on August 8th 25123 & 25136 were noted with a northbound merry-go-round coal working at Kingsbury. A Leicester - Skegness roundtrip was worked on August 30th with 25219 (also reported as 25163). Three days later on September 2nd 25123 & 25132 worked the Walsall - Norwich (for Yarmouth) - Derby diagram. The next day (3rd) the same pair worked a roundtrip Leicester - Skegness, on the return leg working as far as Nottingham where both locomotives were removed due to the failure of 25132. On October 25th the 13.35 Newcastle - Swansea was worked by 25123 from Gloucester to Cardiff having replaced 40107. 25123 was noted at Haymarket depot on April 14th. A Norwich - Birmingham New Street working was noted at Wigston behind 25123 on June 8th. On June 13th the early morning Toton - Eastleigh freight was worked at least as far as Oxford by 25123. A Bulmers Cider 'Cambrian Venturer' charter from Cardiff to Pwllheli on June 16th was worked by 25123 roundtrip (?) Shrewsbury - Pwllheli. The Derby - Norwich - Yarmouth - Norwich - Walsall diagram was worked on June 23rd by 25123 & 25061. A month later on July 21st a Leicester - Skegness roundtrip was worked by 25123 & 25248. On August 11th a Walsall - Norwich (for Yarmouth) - Derby diagram was worked by 25123 & 25132. The next day (12th) the same pair worked a Leicester - Skegness roundtrip. Three days later (August 15th) the same pair were again at Skegness with a roundtrip relief from Derby. The Derby - Norwich - Yarmouth - Norwich - Walsall diagram was hauled by 25123 & 25121 on June 21st, the next day (22nd) a Rugby - Barmouth charter was worked roundtrip Wolverhampton - Machynlleth by 25123 & 25152, the portion to Barmouth utilised a diesel multiple unit. The Derby - Norwich - Yarmouth - Norwich - Walsall diagram on July 19th was worked by 25123 & 25129. Another Cambrian line working took place on September 13th with 25123 & 25132 on the 04.10 Shrewsbury - Aberystwyth and the 10.07 Aberystwyth - Euston to Wolverhampton. Photograph courtesy Tony Sayer. 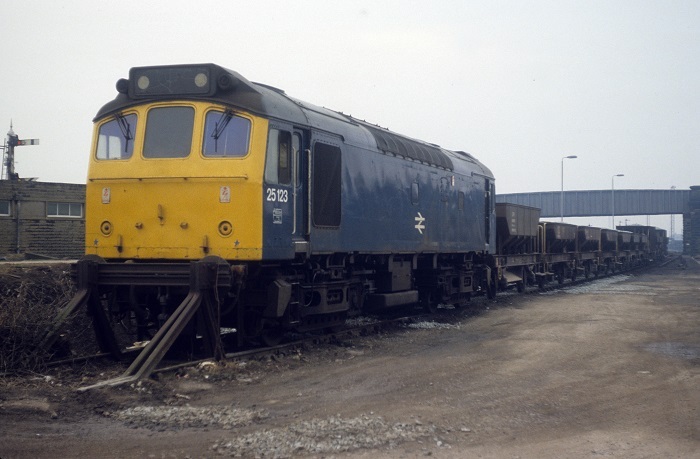 On March 14th 1981 25123 awaits entry into the servicing shed at Toton. 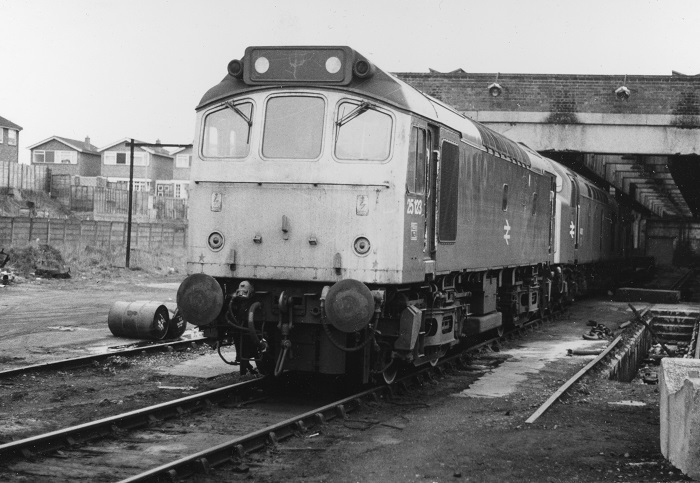 This is one of the Class 25s that had its boiler room grilled sheeted over. 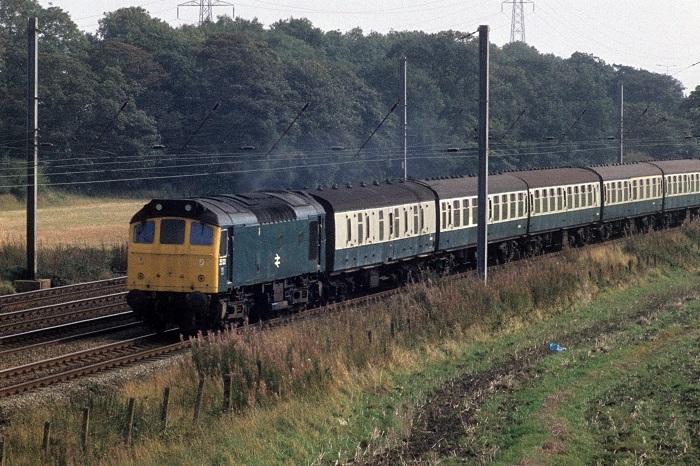 During October 1981 25123 was transferred to Crewe, ending a lengthy spell at Toton. 25123 was north of the border on August 1st working a Carlisle - Glasgow Central service. On September 6th a Northampton - Aberystwyth day excursion was worked out & back Shrewsbury - Aberystwyth by 25123 & 25188. During October 25123 was transferred to Crewe leading to future passenger workings having a north-western flavour. Photograph courtesy Jerry Glover. A fine view of 25123 & 25235 with a lengthy train at Warrington on a damp May 19th 1982. 25123 has about one more year to run before being sidelined at Springs Branch. It was a trip to the north-west on June 30th with 25123 working the 17.15 Manchester Victoria - Blackpool North. A month later on July 31st 25123 & 25146 worked the 10.10 Euston - Aberystwyth from Birmingham New Street, returning with the 16.05 Aberystwyth - Shrewsbury. The next day the same pair worked the 08.45 Birmingham New Street - Aberystwyth from Shrewsbury, the 16.40 Aberystwyth - Machynlleth and 17.25 return and the 18.15 Aberystwyth - Euston to Wolverhampton. On August 17th 25123 worked the 15.02 Manchester – Bristol parcels, with the train containing a number of preserved vehicles. On September 15th 25123 worked the 07.45 Manchester Victoria - Bangor, the 11.53 Bangor - Manchester Victoria and the 15.45 Manchester Victoria - Bangor. Photograph courtesy Roger Geach. 25123 with the 11.53 Bangor - Manchester Victoria at Winnwick Quay on September 15th. Diesel multiple unit failures on the Morecambe - Leeds route, saw 25123 handling eastbound workings on November 8th & 9th. 25123 was noted northbound at Skipton North Junction with an empty ballast train on February 24th. Photograph courtesy Roger Geach. 25123 with a ballast train at Skipton on February 24th 1983. The last recorded passenger workings for 25123 took place on April 7th working the 15.45 Manchester Victoria - Bangor forward from Chester after 40034 failed and the return 19.26 Bangor - Manchester Victoria. 25322 & 25123 were noted at Manchester Victoria on a miserably wet April 9th. 25123 was withdrawn on May 1st 1983. On September 23rd 25123 was towed to Bristol Bath Road for undisclosed reasons. It was moved to Swindon Works on November 18th 1984. Non BIS side: light scrape on bodyside from radiator screen to center of bodyside at height of BR emblem: from at least March 1981. Page added July 26th 2013.